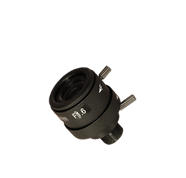 The CCV-0605IRB security camera housing has a basic clamshell construction and includes a bank of infrared LEDs that radiate up to 30 meters (~98 feet), depending upon atmospheric conditions. It also contains a heater and blower assembly that keeps the camera working on cold temperatures and prevents the inside of the glass from frosting up or fogging. This housing is intended for full size cameras with infrared sensitivity that lack built-in IR LEDs. This housing is weatherproof and has a lockable metal latch and is designed for box-style surveillance cameras. Sealed by rubberized weather-strips. Perfect for full size color security cameras. It has an internal metal bracket that can be customized to fit a wide variety of shapes and sizes. Dimensions: 14 3/4" x 5 1/2" x 4 1/4"